If your garage door is broken, you might be thinking about doing the repairs yourself. After all, it can be fun taking on home repairs yourself. It can also be quite gratifying. How hard can it be? You are a pretty handy fellow who owns a lot of tools, everything you need to make those needed repairs. As you ponder what needs to be fixed on your garage door, you dream about what you are going to do with all of that money you save not having to call the garage repair service. Garage door repair is a whole lot different than other types of home repair. For example, fixing a leaky faucet doesn’t really put your life in danger. The worst that can happen is that you sprain your wrist while trying to loosen the pipe. Garage door repair can be quite dangerous if you don’t know what you are doing. 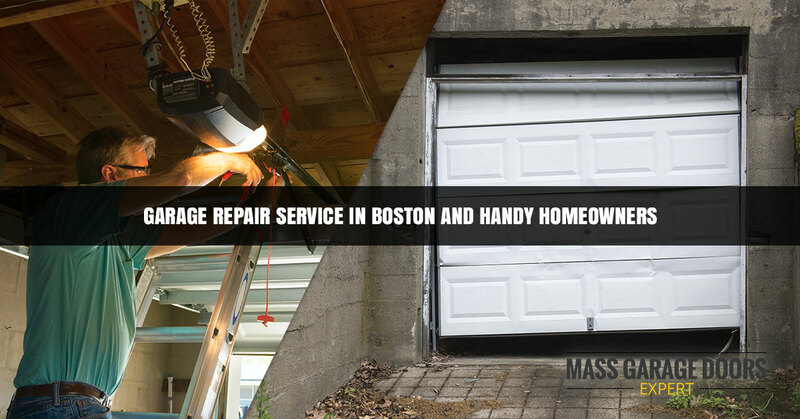 Mass Garage Doors Expert, your garage door repair service in Boston, offers the reasons why you shouldn’t fix your own garage door. We may have mentioned this before, but repairing a garage door can be dangerous. Your garage door has several moving parts, all of which could injure you if you aren’t super careful. Many homeowners wind up in the emergency room with injuries sustained while attempting to fix their garage door. In addition, the spring for your garage door is under a lot of tension, if it snaps it could sever a limb or worse. Also, many older garage doors are very heavy and you wouldn’t want it falling down on you. If you make a mistake while attempting to fix your garage door, it could wind up costing you a lot of money. If you damage another component while trying to fix your garage door, that will cost extra money. Also, a botched garage door repair might result in a garage door that collapses on your car. Most garage door manufacturers provide warranties ranging from three to 10 years. If something ever happens to your garage door, these warranties could save you a bundle of money. However, many of these manufacturers will consider the warranty void if work on the garage isn’t done by a licensed professional. We don’t even know where to begin. For starters, garage door services offer warranties on their work. This means if the door fails to work after a week or month, it gets fixed free. An improper repair might leave your garage door unbalanced. At best, this will let in cold air and at worst, it creates a dangerous scenario. A professional will ensure the garage door is balanced and secure. We understand that you are quite handy and own a lot of tools, but this doesn’t mean you should be doing the repairs in your broken garage door. Instead, give Mass Garage Doors a call.